Central Asian peoples from at least around 1000 BCE through recent times frequently wore tall pull-on boots. With modifications to height and toe shape, these were used by Arians, Drangians, Parthians, Black Sea Scythians, possibly Bactrians, and others at least as far east as the Altai. Kuz'mina ascribes tall boots to the Bronze Age people of the Andronovo culture, widely believed to include the early Indo-Iranians, so it is possible that the ancestors of the Medes and Persians also wore them. Artwork is scant on construction details, which, of course, probably varied a lot over such a wide expanse of space and time. Black Sea Scythian boots on several artefacts from Kul Oba are shown with a strap that appears to gather the boot leg tight around the ankle. 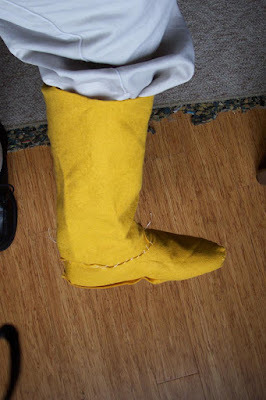 The women's decorated boots from Pazyryk have wide bands of woolen braiding in the same location, but these don't appear to fasten or make the boot leg tighter and instead seem to be appliqued into place (strictly, the Kul Oba ankle straps aren't shown with any obvious method of fastening either). Otherwise boots appear to have no fastening, like wellington or cowboy boots, which are a modern iteration of the same equestrian concept. The Chärchän Man's surviving boot doesn't appear to have an ankle strap, but is seamed between the foot and leg. On balance, I would call the evidence inconclusive. Since I have thin heels and wide toes, my heels tend to lift out of any pull-on boots that are wide enough to fit my toes into. I'm making some felt mock-ups and plan to tie straps around the ankles to see if they can be left as separate pieces or need to be partly stitched down. On Medo-Persian low shoes, the strap has to be attached, since if it rides up even a little, it will be above the top edge of the shoe, and thus fail to serve its purpose of tightening the shoe around the ankle so it stays on the foot. It doesn't seem to me that tall pull-on boots would have such a strict requirement. On the other hand, as noted above, stitching the strap down all the way around would make it impossible to adjust, which could well result in a worst-of-both-worlds setup in which the strap impedes putting on and taking off the boot but isn't tight enough to provide good fit around the ankle. Sergei Rudenko states that the Pazyryk women's boots are seamed at the back, which makes them sound similar to Plains moccasins. Some Plains boot moccasin patterns may be ideal, but the ones most readily available to me are laced and in such case, I figure I might as well wing it when it comes to fitting the leg, since lace-up shafts won't fit in the same manner as pull-on ones. The Pazyryk boot legs were open in back, but artwork seems to show that most Scythian boot legs were closed. The commercial cowhide split I'm using is an inexpensive substitute for a fat-cured leather, but both it and the German-tanned buckskin I used for my gorytos are quite lightweight and floppy. I expect that leather boots had linings to stiffen the legs and prevent too much sagging, and luckily, I have some lining leather on-hand. A double layer of the outer material or a felt lining would also work. Whatever the material, a few rows of stitching to add a little bit of quilting effect should increase stiffness, ensuring that the lining and upper behave as one piece of material. For cold regions and seasons, a dense shearling hide might get by without an added liner or could even be the liner for a de-grained leather outer. Soles might have been a single or double layer of soft leather, thick felt, or rawhide. Rudenko describes one of the Pazyryk soles as "chamois" (which may mean chamois goat or just soft suede - I don't know what the original Russian word was) and another as having "a heel of thick (2mm.) rigid leather." However, one look at the ornamented Pazyryk soles shows that they weren't made for a great deal of walking, and were likely intended just to show off while sitting or while riding side-saddle. I'd prefer rawhide, but it works best with special processing such as de-stretching, and most of it on the market tends to be either very thin (goat hide, drumheads), too stiff (most bleached sides and boiled chew toys) or sold in costly whole sides (heavy cowhide, bison, etc.). There are apparently rawhide soles commercially available, but I failed to find any before just ordering some latigo pieces. Better luck next time! Latigo is heavy wax-stuffed leather used for saddlery and other weather-resistant outdoor equipment, and the most common material for modern "hardsole" moccasins. White latigo looks like bleached rawhide but is much more flexible. Moccasin-makers around the Web have opined on the pros and cons of rawhide versus latigo with regards to durability, ease of sewing, comfort, traction and so on. But either one should be acceptable for occasional reenactment use; rawhide simply has the edge as being more historical. I wouldn't blame anyone for sticking with soft soles, though; they would be less protective, but far easier to stitch and more flexible if you prefer that. Hemp and wool thread (used in Pazyryk felt stockings), sinew (used to attach the Pazyryk boot soles) and linen would all be appropriate stitching materials. Artificial sinew and other synthetics would work as well. For the final construction, I'm currently planning to use all waxed linen, since it's the only historical material I have on hand: heavy cord for the soles, and light cord or multiple rows of thread to assemble the uppers. Assembled materials ready for measuring and cutting, including felt for the mock-up. The spool of artificial sinew, next to the scissors, was my initial choice for assembly before I obtained some linen cord. The first step is to find the correct size. I normally wear a men's size 9 wide, so this is what I initially went for in measuring and cutting. The Missouri River pattern is unfolded, laid out, and pieces of tracing paper are laid over the desired sections and weighted with various objects. Trace with a pencil or ballpoint pen so the ink won't bleed through the tracing paper onto the original patterns. In Plains moccasins, the topline is not a hole but just a T-shaped cut; the moccasin extends to the ankle and has a lace running through slits, and a tongue is sewn into the front. Here, I'll be cutting away material from the topline to make that swooping seam seen in the Chärchän and Pazyryk boots. No tongue is needed because the foot will be protected by the boot leg. The paper copies of the original patterns are pinned to the felt, traced in ink and cut. The felt pattern should become the permanent pattern cut for my own feet if everything goes well. As recommended, I added a welt between the sole and upper for the first attempt, but have since decided that this made things needlessly complicated, especially since I'm going to be using insoles. After cutting out a nicely rounded topline, I attempted to measure its perimeter with a tape measure and then cut a big rectangle for the leg. Then I stitched it all up loosely with dental floss. It turns out the size 9 fit FAR too small on me, being too short, too narrow, and too flat in the toe. It may be partly that these moccasins are designed to be worn without socks or insoles, or they may just run smaller than they should, I don't know. Add to that, a true fat-cured leather would stretch with wear. After two more attempts, I now have a pattern that will accommodate my stocking foot and an orthotic insole comfortably, made by combining the back half of a size 10 with the front of a size 11. In fact, it's a bit too wide now, though a good length. I don't know if the welt running up the back was used in period, but it's one way to accomplish a flat seam without overlapping the edges and causing a raised edge that could chafe the achilles tendon. Of course, the welt itself could prove irritating due to being an extra-thick, less flexible part, and any kind of raised seam would be. The next step will be to cut all the stitches I've just done, do some slight final adjustments to the foot and sole pieces, and then start tracing onto leather.